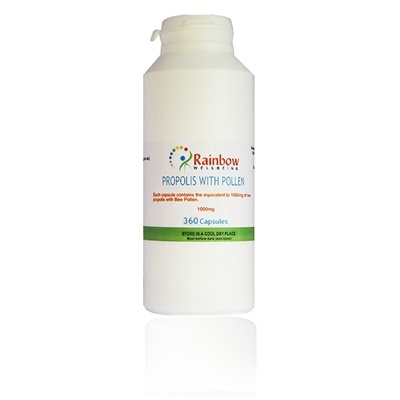 Propolis is being hailed as a natural antibiotic with no side effects, a helpfull remedy for; blood Disorders, Gastro Intestinal problems, Sore Throats, Bruises and burns, Respiratory problems, Acne, Arthritis and Rheumatic Ailments, Sore Lips, Gums, Teeth and other dental problems etc. Each capsule provides the equivalent of 1000mg of Raw Propolis with wild flower bee pollen, no artificial flavours or preservatives, no added sugar, salt or colours. Free from gluten, wheat, yeast, corn and dairy products. Each capsules contains the equivalent to 1000mg of Raw Propolis with Wild Flower Bee Pollen.